Today, on 18 December, the government of China celebrated forty years of reforms. Today, on 18 December, the government of China celebrated forty years of reforms. The reform period begins in 1978, when the then Premier Deng Xiaoping moved China from a Maoist development paradigm to a paradigm that included socialist institutions and the market economy, which was known as ‘socialism with Chinese characteristics’. The epicentre of the celebration was Tiananmen Square. 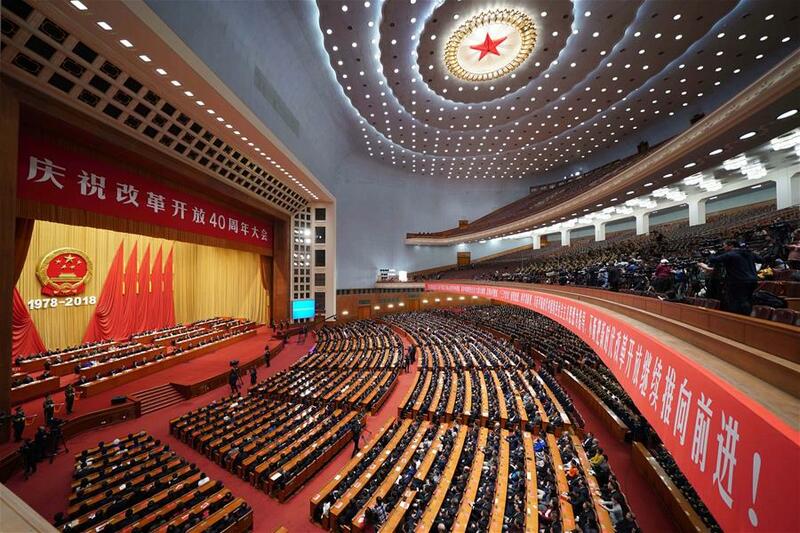 On one side – in the Great Hall of the People – senior Communist Party leaders and others gathered to hear a speech from President Xi Jingping. 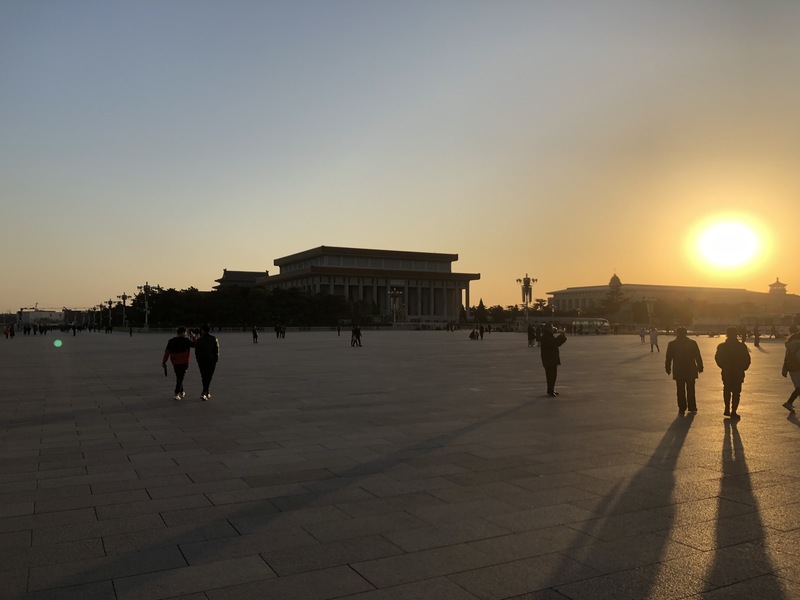 On the other side – in the National Museum of China – thousands of people lined up to see a spectacular exhibition dedicated to the reform era and to the ideas and policies driven by the post-1978 governments. In his speech, Xi said that the Chinese people are now largely free from the ‘torments of hunger, lack of food and clothing, and the hardships that have plagued our people for thousands of years’. Xi did not only stress the importance of the reform era’s role in these changes. He said that there were three important signposts in the modern history of China – the May Fourth Movement of 1919, the Revolution of 1949 and the reform era. In these past forty years, Xi said, China has lifted 740 million people from poverty, has created a social security system that covers more than 900 million people and medical insurance that covers 1.3 billion people. These are considerable achievements. These developments came about, Xi said, because of the leadership of the Chinese Communist Party – which had given China unprecedented stability. The reform agenda, he stressed, was not driven by any external agency. ‘We must reform what can be reformed and we must not reform what should not be reformed’, he said. No reform must come, Xi said emphatically, if it does not have the ‘backing, approval and endorsement of the people’. ‘No one is in a position to dictate to the Chinese people what should or should not be done’, Xi said. China’s growth and stability, Xi said, has led it to becoming a major player in the world. ‘China cannot develop itself in isolation’, he said, ‘and the world needs China for global prosperity’. But China will not exert itself to interfere with the development pathways of other countries. None of what Xi said came as a surprise. This is essentially the summation of his general theory – Xi Jinping Thought. This was perhaps not the place to address China’s slowing growth rate or the trade war with the United States. But all the problems hung over the address, which was celebratory in tone and not delivered to be summarised on twitter. 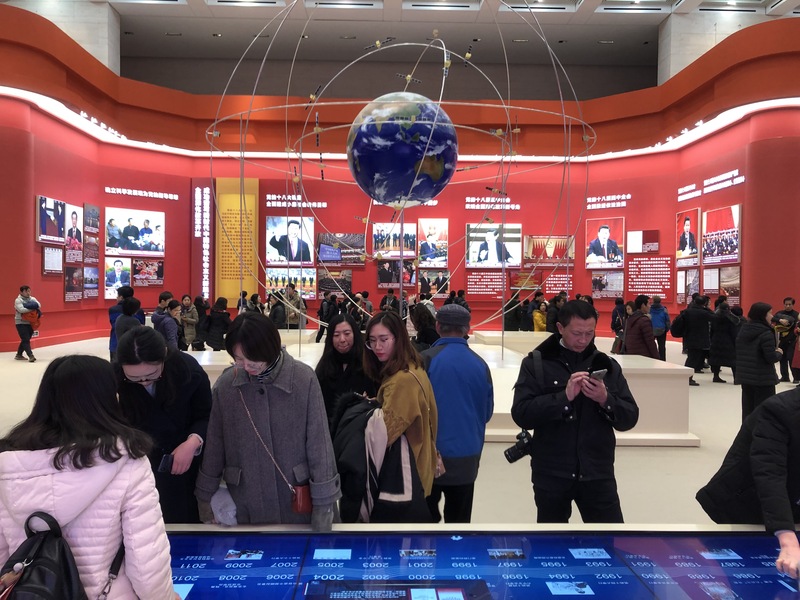 Across the road, in the National Museum, the crowds walked from one exhibit to another, marvelling at China’s developments in science and technology and over hunger and disease. 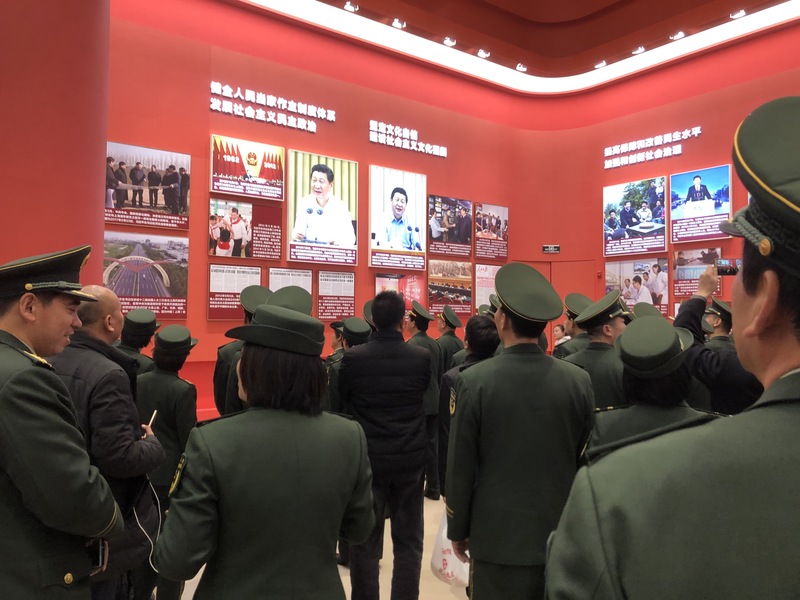 Ordinary people, from all walks of life, stood before the exhibits and took selfies with images of Xi Jingping. 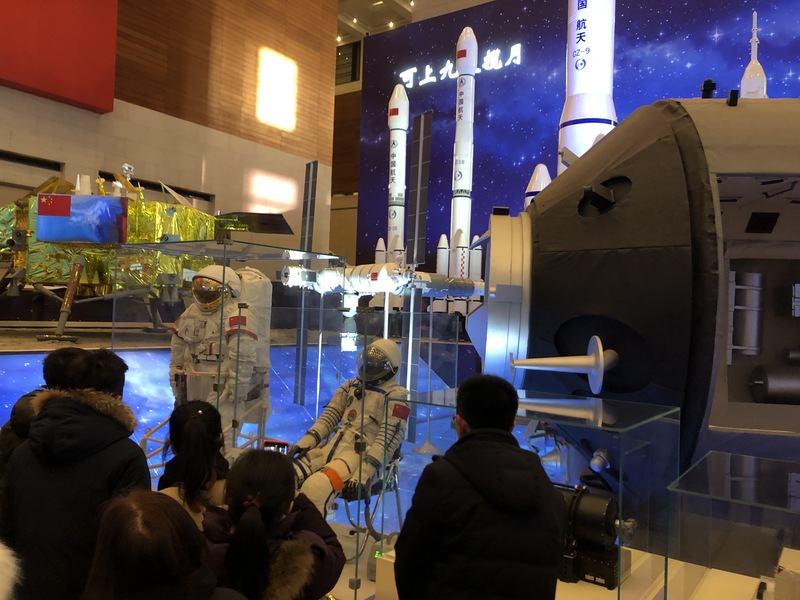 There were replicas from China’s space programme and images of Xi’s Collected Works. There were images of the future cities of China and images from China’s great engineering feats along the One Belt, One Road Initiative that runs from China to Turkey. What was absent was the Revolution of 1949 and its iconic imagery. In the darker corridors of the museum hung portraits of the revolutionary period, with Chinese communists struggling over hills and across rivers in their fight against the Chinese nationalists and the Japanese imperialists. That was the backdrop. There was no image of Mao. His mausoleum is a few metres away. But his presence was negligible. The authors of China’s new transformation were Deng Xiaoping, Jiang Zemin, Hu Jintao and above all Xi. Xi Jinping has put in place institutions to revive Marxism in China. It has not been easy to define what precisely this Marxism will include. Socialism With Chinese Characteristics has its own sensibility – a Marxism with the state as the force of stability. Little of this Marxism is available outside China. The Chinese government has not taken steps to share the contours of this thinking. There is no major translation project at work. It would be useful to have more than a cartoon assessment of what is ongoing in China. There are strains, of course, and disappointments and elements of harshness that need to be redressed, but there is also a realisation that the government has indeed held a course and lifted people from great suffering.